Are you scared of beans? Beans are easy to cook and prepare. And when prepared well, they are delicious and digestible. You'll even save money when buying dry beans instead of canned! They are a source of high quality, inexpensive nourishment. They offer minerals, B vitamins, essential fatty acids, not to mention soluble and insoluble fiber. Beans contain phytic acid, which can impede mineral absorption if not neutralized during soaking or cooking. But also, harder beans (such as black beans or navy beans) contain large, complex sugars called oligosaccharides that can “completely confound digestion” (source). So prevent these undesirable results, proper preparation is key. Here's how. Start with new crop dry beans. Dry beans that are more than 13 months old are not only less nutritious but harder to rehydrate, and therefore more difficult to cook completely. Reputable natural food warehouses and health foods stores with good turnover can provide delicious, healthy, and young dried beans. The best beans are brand new to 4 months old. Admittedly, this is hard to know. In general, older beans are darker and show more cracked skins and more splitting overall. 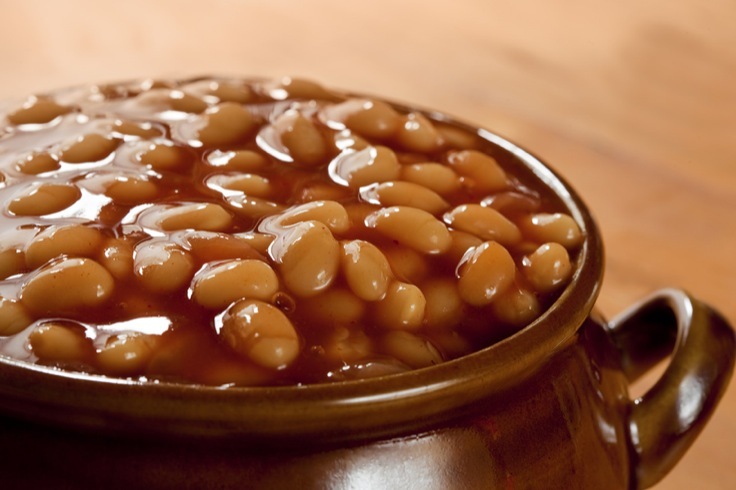 If you're worried your beans will be tough, adding a pinch of baking soda to the soaking water can be very helpful. Choose your crockpot or stockpot carefully. It needs to be big enough so that the dry beans do not fill it more than 1/3. Otherwise, you will not be able to fit the amount of water required to cook them thoroughly. I will be sharing 2 easy methods for cooking beans properly: on the stovetop or in the crockpot. Both require that the beans start with a good, long soak. Put dry beans in the cooking container (stockpot or crockpot). Fill with triple the amount of water as beans. Optionally, add a pinch of baking soda to the water to help with toughness. In the Stockpot: Bring all to a light simmer, then turn off heat. Cover the pot and let beans soak a minimum of 7 hours, but preferably overnight or 12 to 24 hours. In the Crockpot: Put the lid on the crock. Turn the crockpot to HIGH for 1/2 to 1 hour to warm up the mixture. Turn off the crockpot. Let beans soak a minimum of 7 hours, but preferably overnight or 12 to 24 hours. Normally, bubbles and maybe a little scum appear on the top of the soaking water — rinse this all away. The beans should smell “bean-y”. If they smell rotten, rinse them really well, and then smell them again. If they still smell rotten, they probably are. Unfortunately, you’ll have to toss these beans and start again. Drain and rinse the beans. Cover the beans in the stockpot or crockpot with water. The amount of water should be about double the volume of the beans, due to the beans rehydrating during the soaking. In the Stockpot: Bring the bean/water mixture to a boil, then cover all or partially as the boil reduces to a constant simmer. Watch for foam, and skim as it appears. Boil gently until beans are tender — about an hour for soft beans, or an hour and a half for harder beans. Turn off the heat. Drain. In the Crockpot: Turn the crockpot to high for one hour, then turn down to low for the duration of the cooking time. Skim foam occasionally, but quickly so as not to lose much heat. 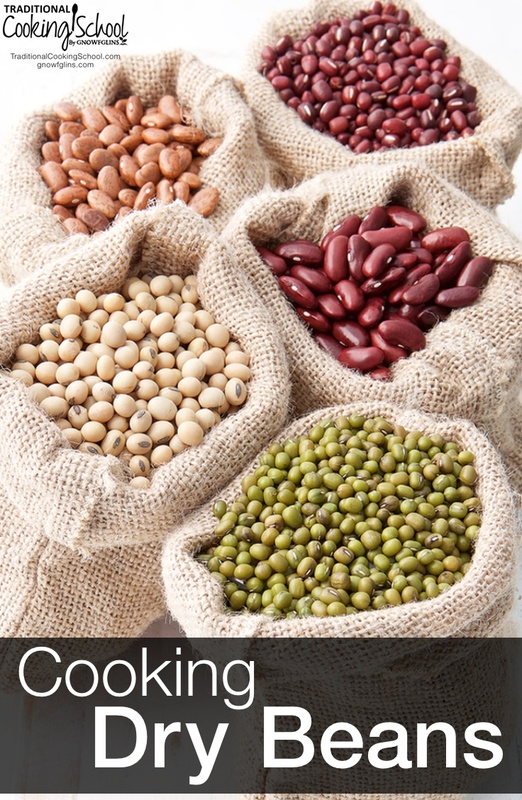 Cooking time depends on the crockpot’s heat output, but generally 8 to 12 hours cooking time is sufficient for most hard beans; soft beans such as lentils and peas will take less time. Turn off crockpot. Drain. Note: Soft beans, such as lentils, peas, or split mung beans, will often be falling apart by the time they are tender. Therefore, when just starting out preparing these beans, it is advisable to follow a recipe that takes into account the proper amount of water for the desired food consistency. For old beans that don’t seem to want to soften up, add 1/2 teaspoon baking soda or a piece of kombu (Japanese sea vegetable) to the cooking water to help them along. Either of these will help reduce the gas-producing properties of beans. If I'm adding soaked, uncooked beans to a soup, I add flavor ingredients like spices, seasonings, bones (turkey, ham, chicken, etc. ), and broth during the cooking time. The beans cook while marinating in all the yummy flavors. If I'm adding cooked beans to a dish (such as beans and rice, refried beans, or even soup), I add seasonings after the cooking. Experiment with all your favorite herbs and spices — basil, thyme, oregano, cumin, smoked paprika, cayenne pepper, and of course, sea salt, pepper, ginger, or garlic. Add oil and onions too! Grab a free video on cooking beans from inside our online class Fundamentals — along with 4 other free videos — right here! This article includes information from the article, Putting the Polish on Those Humble Beans from the Weston A. Price Foundation, as well as information from the book, Nourishing Traditions by Sally Fallon Morell. What can you share about cooking dry beans? Do you follow Traditional methods? We frequently cook dry black beans – we love black beans seasoned in a south american style over rice. There is no comparison between beans done well from their dry form to canned beans IMHO. Ellen, that sounds yummy. What seasonings do you use for South American style? I agree with you about beans being tastier when cooked from dry instead of canned. Plus, they’re much more healthy. I’m cooking dry beans for the very first time today. I soaked them over night and rinsed them this morning. Are they supossed to smell funny? I chose navy beans. Now that they are soaked is it o.k. to cook them in a pot on the stove or should they be put in the crock pot? Thanks for the info, I was so pleased to find this website! I’m not sure what you mean by funny smelling? Normally, there may be some bubbles and maybe a little scum on the top of the soaking water — rinse this all away. They should smell “beany”. If they smell rotten, rinse them really well, and then smell them again. If they still smell rotten, they probably are. Hi,Diane. While I’m not sure exactly what you mean, I’m thinking that the milky water is the starch from the beans thickening up the water. I fear I’m not really a help to you in this question, but I do appreciate you asking it! I’ve been looking to expand my cooking skills and decided to work with black beans. I immediately went out and bought a couple 2 cup bags, but had NO idea as to how to cook them! After searching the internet for the last three days, this solves my dilemma :). I’ll be boiling black beans, rice, and baking some boneless/skinless chicken breasts to complete the dish. I haven’t cooked dry beans for some time. I think I will use method 3. The only difference I have a hambone from Christmas so I am going to soak northern beans tonight and put it on to cook tomorrow afternoon for about 3 hours or until tender. Thanks for your information. It refreshed my memory. Please let me know it works for you. Both your menus sound delicious! It was DELICIOUS! I barely had to season them afterwards :). I ended up baking a boneless/skinless chicken breast and seasoning it with a bit of garlic powder & garlic salt, seasoned salt, and pepper. The rice was very simple, just boiled with a dab of margarine. When the dish was complete, I just sprinkled a bit of pepper over the beans & rice (not sure how to season them southern style yet), and it was very good :). Thanks again for the methods, and if i make anything new, i’ll let you know! Deejay, that is great! I’m so happy the method worked for you. Isn’t amazing how simple foods can taste sooo good? Your whole meal sounds delicious. Thanks for sharing. I plan on cooking beans tomorrow using Method 1 however I want to add either turkey necks bones or turkey wings to the pot. Being that I am going to be using my crock pot do I have to add any extra water or use less beans or anything. I will assume that tonight you are going to soak the beans as desribed in Method 1, without turkey. Then tomorrow, drain and rinse your beans. Put them back in your crock, fill it up with plenty of water (3 to 4 inches over the top of the beans). Then add your turkey parts. This way you’ll be sure to have plenty of water for the beans. The turkey parts will absorb minimal water. How many turkey parts will you use? If just a couple, I wouldn’t adjust the amount of beans. If a substantial amount, it would be a good idea to use less beans, so that during cooking there is enough room for all ingredients. I am soaking ( yes without the turkey:-)) as I type and then tomorrow morning i will rinse and cook with the turkey. There is about 4 pieces of turkey but I soaked a whole bag ( 1lb) of beans. Is that too much? Raquel, I don’t think that’s too much, as long as your pot is big enough. The flavor should be wonderful! I hope you’ll let me know how it goes! Help! I soaked my black beans overnight, poured off the soaking water and put in fresh water to cook today, but after 5 hours, they still aren’t softened up like usual. I had put a can of diced tomatoes in, but no salt. I checked the “expiry date” and it’s not til later this year. Is there any other reason they’re not softening up after hours of cooking? Should I be wary to eat them because they’ll cause too much gas? Nikki, next time, try leaving the tomatoes out until the beans are already tender and DO add the salt at the beginning (unless you aren’t using salt at all). I don’t remember all the how’s and why’s, but I have read that in various places, and my experience has me convinced. Good luck! 1–Soaking in warm water– Quite often, I’m culturing or raising something in a warm place anyway (especially during colder months), so my beans get their soaking there, too. Some studies and discussion on phytic acid suggest that while acid is a good thing to help break it down, TEMPERATURE can accelerate any chemical reactive process, even where the Ph isn’t “ideal”. Still looking to learn more on that. 2–cooking them WITH salt– My Mom always insisted you add NOTHING to beans until they are soft, but since I came across various blogs insisting that they will not be as tender without salt, that really HAS been my experience. I love that I don’t have to check in on them (hoping to salt them after they’re tender, but long enough before dinner that the salt isn’t just in the water). By the way, I absolutely DO add meats/bones/onions and slow-cooking vegetables at the beginning, with great results, just still clinging to the wives’ tale about acid hardening beans in cooking… BUT open to being proven wrong. Best beans to all! So I’m just getting into “beaning” and I’m wondering about this soaking process. Some folks say the acidic medium may turn beans mealy and tough, and that you actually want to brine them instead. I think Americas Test Kitchen did an experiment… Not sure. Is there anything about the soaking process that might make beans tough? And would salt neutralize phytic acid? they are softened. Or they never will. I have learned this the hard way. How are you cooking the beans? If in a slow cooker on low, 5 hours isn’t too long. You could go for 8 hours or so. Some older slow cookers take 8 to 10 hours to cook beans, while the newer slow cookers will cook up more quickly. So, this answer also depends on what your slow cooker is like. If on the stove top at a simmer, they should be soft by now. If they aren’t soft, then I would say you’ve got some old beans (no matter what the expiration date says). Some beans are so old and dried up that they won’t soften up when cooked. This happened to me once. It is disappointing, but not normal. Unfortunately, this happens quite often with packaged beans from a regular grocery store or from a bulk section that doesn’t get much turnover. If they aren’t done, I wouldn’t recommend eating them. You will get gas. 🙂 No good! Please let me know if you need any more help. I’m sorry your beans aren’t turning out. I’m wondering how many dried beans to cook to replace a 15 oz can of beans. I’m thinking the goal is to make about 2 cups of cooked beans but I’m brain-dead when it comes to what ounces are. Well… 😀 You’re going to test my math here. Let’s say that the beans will increase by 3 when cooked. This is average; some beans, such as navy beans, only increase by 2-1/2 times. 15 ounces is about 2 cups (8 ounces per cup). So you’ll need to start with 1/3 of 2 cups, or 2/3 cup of dry beans. I would use 1 cup just to be safe. Then use 2 cups of the cooked beans in your dish. Hello there I need some help with determining how much beans to cook to feed 200 people it is for a buck and doe we are having if you could help it would be greatly appreciated. Hi, Sharon. That’s a really good question. How many beans do you expect each person to eat? I’ll assume about 1 cup. That means you’d have to cook enough beans to result in 200 cups of cooked beans. On average, beans triple their volume when cooked. So you’d have to start with 1/3 of 200 cups… or 67 cups (rounded). If you want each person to have 2 cups of beans, then double 67… 134 cups. A big 25 pound bag of beans probably has about 50 cups of dry beans in it. You’ll need some really big roaster ovens to accommodate all those beans. Hope this helps and have fun! I cannot find any dried cannellini beans at our local stores. If I substitute canned cannellinis (which I can find) how many cans do I need to use in a recipe that calls for 8 oz of dried beans? Thanks. Julia, I have a bean cooking chart that lists cannellini beans as a type of kidney bean. So you could probably substitute kidney beans without changing the flavor too much. If you go ahead and buy canned cannellini beans, their volume is triple that of dried cannellini beans. So you’ll want 24 ounces of canned beans. I think most cans are about 16 ounces? You’d need two cans, but you wouldn’t use all of them. Hope this helps! I’m glad they worked out for you, Sadie! I was wondering, when you say “Move the pot to a back burner”, do you mean it should be on a low flame, or no flame at all? I have red peans and pinto beans that are 15 yrs. old. Any tips for getting them to soften/ and/or cooking with them? I am having a consistent problem getting my beans to cook. I’ve tried both quick soaking and overnight soaking but no matter what I do, or how long I simmer them on the stove I they never soften. I’ve tried cooking black and pinto beans. I can make food so yummy it will bring tears to your eyes, but I can’t cook a bean!! Am I just cursed? No, you’re not cursed! I would venture to guess that you’ve got old beans. Have you tried beans from different sources? The beans sitting in the bags in the regular grocery store are typically not that great of quality. What you want to find are beans, organic beans, from a health food store or a bulk section. Make sure they get alot of turnaround, which will assure you that they are fresh dried beans. Anytime I’ve been out of a natural, fresh, good quality food item (a grain, molasses, beans, whatever) and I bought a little bit to “get me by” in the regular grocery store section (not bulk and not natural food section), I am always disappointed with flavor, texture, quality, richness. There is a difference. If you’ve got good quality beans, it is possible that they’re old. Many health food stores are not highly trafficked enough to ensure that the food hasn’t been sitting there for ages waiting to be purchased. 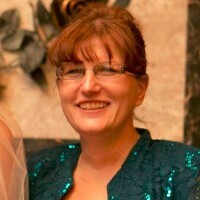 I’m new to your blog and can’t believe how timely this is for me! Our budget has taken a turn and I just bought a variety of nice beans and lentils and chick peas to see if I could economize by cooking from scratch and here I find this great blog entry! I have really enjoyed all the discussion and the idea of using a slow cooker, which I never thought of. What a great and useful article and thank you very much. I too am blessed with many treasures in my family and friends and the bounty of nature. Thanks again. So, for old dried beans, add 1/2 tsp. baking soda during cooking or during soaking? You said to add to aid cooking . . .
of cooking . . . .
Hi, I have tried cooking dried beans 3 times now. Last night in the slow cooker nearly all of my beans split open and I ended up with black bean goo this morning. Please help me! I am an excellent cook otherwise and love black beans! Kate, I am sorry about the troubles you’re having with the beans. Here are a few things I would suggest you try. 1) When using the crockpot, use it during the day so you can monitor when the beans are done. Most newer crockpots cook “hotter” than the old ones. If you’re using a new crock, overcooking can easily happen overnight. So a switch to daytime cooking, with monitoring, or switching to an older crockpot should help. 2) Use the traditional soaking method (Method 1). Soak them good and long overnight, drain, rinse, add fresh water and simmer until done. Again, add 1/2 teaspoon baking soda to the cooking water, and no salt. Since they got overdone in the crockpot, I am assuming that these are not hard beans beyond redemption. Please let me know how it turns out for you. Great Blog, only thing is I never cooked a bean, and now that I am in Costa Rica (formerly from the states) I have to cook them myself as they don’t have Bush beans here, imagine that 🙂 , how do you season the beans and when do you season them? Is it best to put whole garlic at the start of the cooking process, I dont see anything posted here in regards to the seasoning of beans, I know some people put chilandra in their beans here in Costa Rica along with onions etc, but I cant use onions as I am allergic to them. Any help would be greatly appreciated. Hi, Tom. It’s great to have you writing in from Costa Rica. There are two ways to season the beans. 1) Add seasonings during the cooking, not the soaking. I do this if I’m adding soaked (but not cooked yet) beans to a soup; they cook up in the soup flavors — spices, seasonings and broth. Some people say not to add salt during the cooking and some say you can. If you have really hard beans (the kind that don’t get soft), adding salt could be a hindrance. 2) Add seasonings after the cooking. I do this if I’m taking cooked beans and adding them to a dish, such as beans & rice, or refried beans, even soup. You need to avoid onions, but just think of all the other seasonings you can use — herbs like basil, thyme, oregano; spices like cumin, paprika, cayenne; salt, pepper and oil; food like ginger or garlic. Add any of these either during the cooking or after the cooking when incorporating the beans into a dish. To the person that recommended baking soda to soften up beans that stay hard after an eternity of cooking; BINGO! It worked in about 20 minutes. That’s great! I love to hear good reports. I have had great success with cooking beans by soaking overnight, but whenever I have tried to use the fast cook method they stay hard. I use cumin and other spices in my beans. HELP! I made pasta e fagioli today for the first time. It smells wonderful. It tastes great too! It’s just the texture of the canellini beans… They are soft & tender, but the outsides are tough & falling off the bean. Looks like little plastic sleeves floating on top of my soup. What did I do wrong? I can’t see anything that you did wrong, Jen. Bean skins do come off, but normally they just peel back a bit off the bean rather than come off completely. I wonder if it was just those beans because you did everything right. I hope you’ll try again, perhaps a different brand or different crop will behave better. Sorry I can’t be more help. I used the overnight soak/cook in crockpot last week with cannelini beans and they were perfect! BUT…yesterday I used the same soak/cook method with garbanzo beans and there were a TON of bean skins completely off the bean. Maybe I cooked them too long??? That’s normal. I wish all the skins would fall off the garbanzos. For a really smooth hummus, I actually peel them by hand. Time consuming but the hummus is ultra smooth. You didn’t do anything wrong! I just wanted to thank you for all the wonderful information on cooking beans. I am a stay at home mom and like to cook from scratch for my family. I have never made beans before, but with all this help I don’t think I can go too wrong!! Thanks so much! You’re welcome! I know in no time you’ll be cooking beans like a pro! How do you make refried beans from scratch. I’ve tried different ways but they never turn out creamy like the kind you get at mexican restaurants. Help. Dawn, have you tried my recipe for Refried Beans? Give it a try, but you might consider blending the beans and water in a blender or food processor a little — so they’ll be less chunky and more creamy. Also, increase how much oil you use. Hope this helps! A past employer once told me that she and her husband ate dry beans quite often (for his dietary needs) but, of course, did not like the by-product of eating so many beans. She stressed that soaking them was necessary, but she found that adding something to the soaking water aided in removing the “gas” from them better than just the soaking only provided. It seems to me like it was baking soda? Any ideas on what it might be? Kim, yes, people say that baking soda will help with reducing flatulence. But also, I have heard of cooking the beans with kombu, a Japanese sea vegetable. But, like you said, just soaking them will help tremendously, and also make sure the beans are thoroughly cooked — uncooked starch causes gas, too. my husband is from Mexico and they tend to add a fresh herb called espazote while cooking to help aid in removing the ‘gas-inducing’ properties of the beans.. You could try finding it in a local hispanic grocery or even in a big supermarket if you have a large hispanic population in your area..
Jamie, thank you for sharing your husban’ds cultural tradition! What other uses are there for espazote? I usually find it fresh and that is how we put it with the beans. I don’t know if it is sold dried or not, as I have never seen it sold in that way. I just looked it up and it seems some people have found it air-dried. Maybe since we can get it fresh they don’t bother selling it any other way. The main way I have seen it used is in beans and I think I also recall my mother-in-law using it in tamales as well. I believe you can also put it in soups, stews and with fish dishes. Pretty versatile actually. Try epazote for making the beans less gassy. I love the flavor and it goes great with cumin. “Epazote is common to Mexican cooking. While fresh epazote should be your first choice, it is often difficult to find. When substituting our dried herb, use one-half the amount specified for fresh leaves. Epazote is most commonly found in bean dishes. It is also used in soups and moles. Read your thoughts on how many cups need for 200 people. Am cooking pinto beans for 200 plus and adding pork skins for flavor. Adding cilantro and tomatoe and onions after they are cooked. I can not determine how many pounds/cups I can cook in a 20 qts. roaster oven. Many years ago …, I used a roaster oven but my mind fails me as to how many pounds I cooked in it. Thanks for any help you can offer. Need to know by the 23rd of April. 20 quarts is 80 cups. Beans generally triple in volume when cooked, so 1/3 of 80 cups is 26-2/3 cups. If you cook 26-2/3 cups of beans, you would use the entire capacity of the 20-quart roaster. Before proceeding, I would recommend you put the 26 cups of beans in the roaster (dry, no water yet) and make sure you still have 2/3 of the pot free for water. If not, reduce the amount of beans accordingly. Cut back a little more to make sure there is plenty of space for the water to bubble and froth, and for your additional ingredients (which sound yummy!). The last concern is… will that make enough beans for 200+ people? Let’s say you end up cooking 20 cups of dry beans. That will yield approximately 60 cups of cooked beans (that is for pintos, which yield 3 times their volume). With this amount of beans, 200 people would each get 1/3 cup. At this point, you’ll have to judge whether to acquire another roaster to cook more. I was wondering why to avoid onions with the pinto beans? I really love onions and they go so good with potatoes and other things. Is there any reason why to avoid cooking them while cooking the beans? I’m really really curious about it! Anthony, I discussed leaving out onions with Tom because he is allergic to them. Then with Irene, she mentioned adding them at the end. That was her stated intention and I’m not sure what her reasons were for this. In my opinion, there is no reason you can’t add onions during the cooking stage, but consider what onions do after an hour and a half of cooking. They are likely to be mush. That’s great if you want just the flavor. Also, onions (at least the yellow) get really, really sweet when cooked for long periods of time and can impart a strong sweet flavor. I’m not sure this would happen in just an hour and a half, but it definitely happens in the crockpot all day. So, it is up to you! There’s no reason I can think of why one should avoid onions. Thanks for the helpful hints on the onions! I was wondering why my homemade baked bean recipe came out tasting more like candy even when I skimped a lot on the brown sugar & molasses… I must have been all the onions that cooked for so long (it had a lot in there). It all makes sense to me now. Back in the 50’s when I was a teenager, I remember great beans of all types. Now, I have tried all your cooking techniques, and still cannot duplicate my grandmother’s or mother’s wonderful beans. If I try to cook the large lima beans today, they self-destruct before they are tender, and the pinto beans have zero flavor. What am I doing wrong, or is that time past forever? Thanks. The only thing I can think to ask you is if you are sure you are getting current crop dried beans that are grown organically? I think you shouldn’t give up; I don’t believe that time is gone forever! THANK YOU for the tip on how to soften beans quickly. I soaked today’s pot of beans all night and cooked in in the crock pot on high from 9 am to 5 pm and they still weren’t soft. Then I boiled them on the stove for an hour and a half and they were marginally softer. I Googled frantically and added baking soda. And now we are enjoying our softened dinner. Thank you! Valerie — good news! Thanks for sharing! Wardee, your advice to use an acid for soaking navy beans seems to conflict with the information from the weston a price article entitled “Putting the polish on those humble beans. The water pH in the formula from this article is stated as a neutral 7.0 I would assume that navy beans, as a white bean, falls under the broad category, “white beans.” The navy bean does not fit under the other categories listed, so I naturally have concluded that a more alkaline pH is recommended, but perhaps you can shed light on the matter. Hi Wardee! Just wanted to let you know that we are using this for soaking/cooking beans. 🙂 What is the acid for? We are using lemon juice. We probably will turn the beans into your refried beans. I printed off the recipe a few years ago and still have it. Have a wonderful week and thank you for these awesome instructions. Hi, Robin! The acid is to neutralize phytic acid, which is present in all seeds. The phytic acid gets in the way of mineral absorption, so it is very good to neutralize. Ever since we have been cooking this way, my mineral deficiencies have gone away. I used to get leg cramps, but no more. I also used to be anemic, and while I haven’t had a test to confirm that I’m not anymore, I certainly am not in an “anemic fog” anymore. I’m glad you’re making the refried beans – so yummy! I followed these directions (well, kinda…) for soaking and cooking my black beans (first time ever doing using dry beans!!) but left out an important step… rinsing and covering the soaked beans with fresh filtered water for cooking. I totally missed the rinsing part, so the acidic water was still in there when I cooked them all day. Do you think it’s still okay to eat? I think they taste alright, maybe have a little “bite” to them, but I’m okay with that, as long as it’s not going to be harmful to eat. What do you think? When you speak of adding acid, I am assuming it is something like lemon juice or vinegar. Am I right? Would I add that to Pintos also, or just the other beans mentioned ie. navy? Thank you for all your help. I certainly enjoy your newsletters. We have been soaking the beans for two days. My husband put some vinegar and because I didn’t know I put some sourdough starter. Yesterday in the night they were cooking for 6 hours. Today we have beans “hard as stones” (well, not as stones, but nearly). Any one has any idea of what went wrong and why? any way to sort it out now? It is a complete mistery! Magan — What kind of beans are they? Not all beans need an acid added to the soaking water. Also with the addition of double the acid, it could prevent them from toughening up — this is some people don’t use acid at all. Did you drain and rinse them well, to get all the acid out, before cooking? Finally, do you know how old the beans are? Older beans will not soften up as easily. If they’re too old, they won’t soften up at all. You could add some baking soda to the cooking water to help them soften up. They are red beans, but the amount of acid wasn’t excessive (I thought it could have something to do with the mix of different types of acid), he put a couple of tablespoons of vinegar and I put one tablespoon of sourdough starter , (for 3 or 4 cups of dried beans). I rinsed the beans the next day for cooking and left them back in water, we didn’t cook them that day, so they were 24 hours more in water and were again rinsed before cooking (total 2 days). My main fear is if they are old, I hope that is not the reason, we buy in bulk and this is a new bag, just opened, we have 5 kilos remaining 🙁 . How do you do it with the baking soda, would you add it to the water soaking and then rinse it? or would you soak it normally and then add it to the cooking water and then rinse them, once they are cooked? My main concern with the baking soda is that we find it very strong the taste to whatever I have tried to add it to, it hasn’t really worked for us in the house, any recipe with baking soda and mi husband will be the first one noticing the taste even if the measure is exactly what was in the recipe. Would it leave any kind of aftertaste? In the past I have always soaked kidney beans and then boiled them rapidly, changed the water, brought to the boil again and then simmered. This was to rid the beans of some poisonous substances. Why is this not necessary? Is is because I’m now soaking them in warm water? Or cooking them for longer? I would greatly appreciate your response to these questions and would also like to take this opportunity to thank you for this website – a great resource on this new direction in my nutritional journey! I really blew it. I guess I didn’t soak the beans long enough. Here is what I did. Simmered in water for 1 hour. I let them sit for an hour in the water, drained, Added all the makings for baked beans thinking they would soften a little while baking 90 minutes @ 350. I added a few cups extra water. I took them to another location and baked them @ 325 for another 2 hours. Then added some additional water and baked for almost 2 more hours. They were still hard. They are now in the crockpot for 3 hrs on high and they still are very firm. Have they beaten me? I was just wondering why you would use baking soda or some kind of acid when cooking beans? Is it to cut down on the gas or what? Thank you for answering such a dumb question. I like to pressure cook beans. For reducing the gaseous component, try the herb epazote, also known as Mexican tea. It has been used by Mexicans, Native Americans, and people living in the southwest. Works great and has a great flavor and a umami quality to it. Works well with cumin. Can also be used in other cooking. Sometimes ones can find it fresh in a Latin grocery. I didn’t read through all the comments, maybe someone already said this but I just bought a pressure canner and the first thing I tried was pinto beans. I soaked them for 12 hours, then cooked them for 1 hour, then canned them at 10 pounds pressure for 90 minutes. They were fantastic!! Next time I will season them before pressure canner them. Am I compromising nutrition by pressure canning them? It was SO easy and tasted way better than properly prepared beans that were frozen for longer term storage. I love to use beans in cooking but they take up so much time…this was a great way to get fast beans on the table! May I have the recipe for the delicious looking baked beans sitting in a brown crock toward the top of this page? Sorry we don’t have a recipe to share with you, it’s a stock photo but it does look good! I live alone and a whole batch of beans is just too much for me to eat “freshly cooked”, also I don’t have a pressure canner, so I’m thinking of dehydrating them AFTER cooking. I do this with rice and pasta, cook them and then dehydrate, so that I only need to add hot water and pop in the microwave for a couple of minutes before eating, sort of “instant” rice and pasta ;). Would this work as well with beans? And would that also stop them from getting “old” and tough? You can definitely do that. 🙂 Be sure to store the dehydrated beans to keep the air out, such as vacuum sealing, so they last longer. I bought Pink Beans. I’m wondering about their hardness-black bean level? Or pinto bean level? Do you know? Thank you so much! Thanks Wardeh. I needed the motivation. I have neglected my pantry dry beans. I’ve always heard that you’re supposed to change the soaking water once in the 12-24hr period? Would this make them even more digestible or is this not worth the effort? Hi! Thank u for all the amazing information you post. I was wondering if u can ellabrote a little more on why does the warm water help with the phytic acid??? Can the water ever be room temp? Should the beans be soaked for 24 hours to make them more digestible and reduce the phytic acid? You can soak beans for 24 hours. Be sure to soak for at least 7 — 12 to 24 is preferred. I soaked a combination of black beans and Great Northerns overnight after bringing the soak water to a boil and adding AC vinegar. I rinsed them after 11 hours and they smell a little “off”…more than just a sour vinegar smell. How can I determine if they are safe to use? I bought the beans in bulk from a co-op 6 months ago. They appear fresh (not dark, shiny intact skins, very few split beans). Does the addition of vinegar change the normal smell of soaked beans? The odor seems to lessen the more I rinse them. Rinsing can remove odors. If, after rinsing, they return to smelling earthy, they are good to eat/continue. If they smell rotten, they should not be used. Thanks for sharing the burger recipe! A good place to obtain fresh dried beans of all kinds from all over the world is: Rancho Gordo. They are located in California and grow a lot of their specialty beans. I have bought from them for years and never been disappointed. Thanks so very much for your attention to detail and all the delicious recipes. Can beans be cooked in the instapot after soaking or is the crockpot best? Sorry for the late reply. Yes you can cook in the Instant Pot after soaking. The cooking time will be reduced. Do you recommended sprouting dry beans before cooking with them?